Almost all girls like the color pink and even after they’ve grown up they still have a thirst for pink. This is the color of princesses, magic, fairy tales, and tenderness. It’s no wonder then that many girls like purple (pink) colors in their makeup selections. However, such makeup can be quite insidious. The main thing is to observe measure, and only then you can achieve excellent results. Pay attention to the fact that the color pink is not for everyone. This is especially true for women with light eyes and skin of pink shades. Pink can make you look unhealthy and inflamed, and give some kind of a sleepy face. If you are not sure that pink suits you, it is better to replace it with a light lilac instead. Makeup in purple shades is quite unusual and looks very impressive, so it is mainly used as an evening makeup. However, this does not preclude its use in the daytime. This makeup is particularly preferred by brunettes because, unsurprisingly, it suits them very well. However, it is a good shade for blondes with a golden complexion as well. 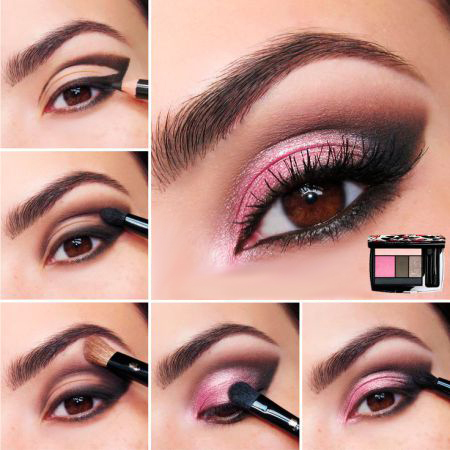 How to Create a Pink Eye Makeup in Purple Shades? First of all, carry out any cleansing and care procedures beforehand and apply a foundation. The lightest shade of eyeshadow is put on the outer corner of the eye, the medium shade in the middle of the upper eyelid. The darkest color is then applied to the outer corner of the eye. To emphasize the eye contour, you can use a blue or violet pencil, carefully blending the line and creating smooth transitions between different colors. To "revive" a person you can place a drop of pearl eyeshadow on the inner corner of the eye and under the eyebrow. Be sure to use black or dark-blue mascara as it is in tune with purple shades. As well as many other types, makeup in purple shades has experienced its ups and downs; it was at the height of fashion and was subsequently dragged back down to an undeserved oblivion. Yet we still cannot deny its unique charm and appeal. It is able to make every girl a real princess as well as a glamorous star, attracting worldwide attention and admiring glances. 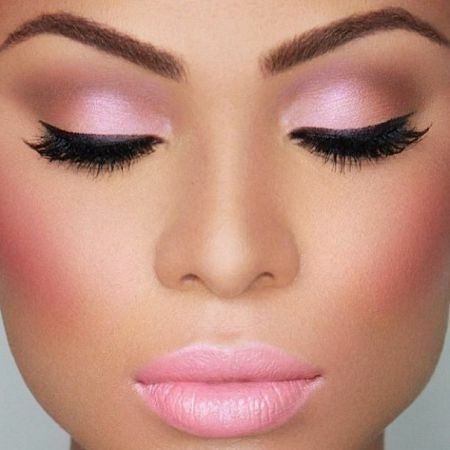 If you've never tried this makeup, it's time to experiment with pink shades. 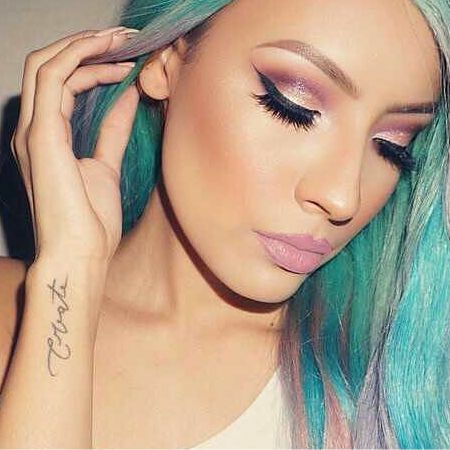 We wish you success in creating your own makeup in purple shades! Like the article «Eye Makeup in Purple Shades»? Share it with friends!